Guest House Kazeyoubi in fact is a private pension with real hotsprings private bath and open-air bath fed with water coming from the nearby Ooumuro Yama, an extinct volcano situated near Ito City in Izu Peninsula. The Guest House is a bit out the ordinary as it is conceived and decorated as a Spanish House with Spanish food as its main course for dinner! 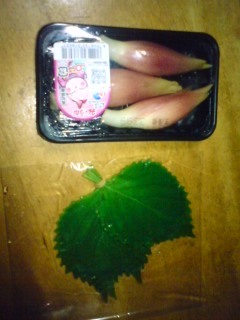 Notice all the shiso leaves! Matsu to Kaze (“The Pine and the Wind”) was opened about three years ago and its popularity has never abated. Fresh produce and good service are the main (evident) reasons. 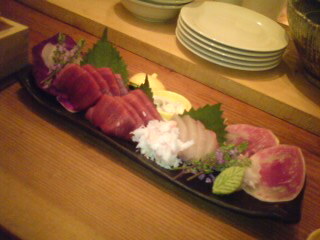 If you ever visit this izakaya in Shizuoka City, do make sure to order their sashimi set of the day! You just can’t go wrong with theirfresh offerings mixing local produce with that of faraway prefectures! Thanks to Foodbuzz for the freebies! Dear Foodbuzz staff, thanks you so much for all the freebies! I actually got a few more than anyone else as I received four different packs of business cards for four different blogs! The eco bag is quickly “changing colour” as most supermarkets have recently started charging for plastic bags in Japan! As for the apron and the spatula, I might have to give them to the Missus as I am allowed in the kitchen only on week-ends when I’m on cooking duty! Last Sunday, as I had to “cook” that evening before the Missus came back from work, I ventured in Shizutetsu Store Supermarket in front of Ichiritsu High School. Frankly speaking, I did not have a clue about I could concoct for my better-worse (sorry, Rowena!). That until I noticed ridiculously cheap seafood on display. Actually October is a great for lots of fish which come in plenty. 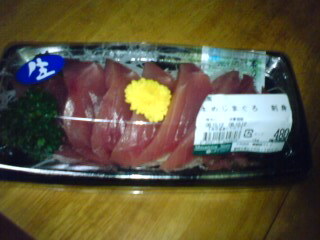 “Maguro Sashimi/Tuna sashimi” for 480 yen. Allison, can you believe it? 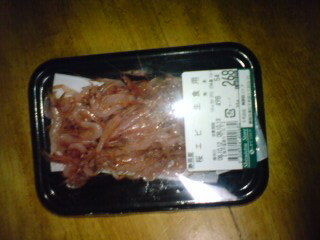 “Sakura Ebi/Cherry Blossom Shrimp” for 268 yen. 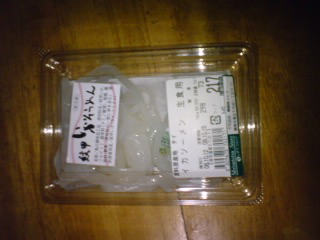 These shrimps are exclusively caught of Yui shore in Shizuoka Prefecture. 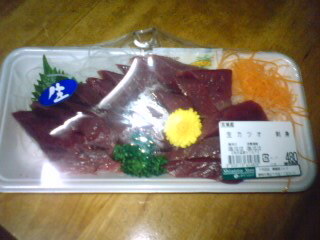 “Katsuo Sashimi/Bonito Sashimi” for 480 yen from Shizuoka Prefecture, of course. Enormous portion! Last Thursday, as I had to atone for some somewhat egoistical pleasure-seeking, I took the Missus to our favourite Sushi Restaurant in Shizuoka City, namely Sushi Ko,located along Aoba Park. 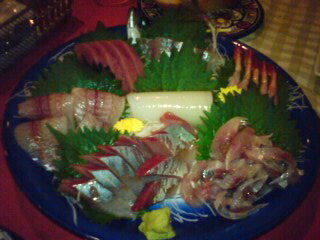 Although we did order the inevitable favourites, “katsuo/bonito” sashimi, “Shirako to Ankimo/Combination of Cod Sperm sacs and Frogfish/Monkfish liver”, “Pon Kara Maguro/Deep-fried tuna cubes”, “Shishamo/Spirinchus lanceolatus”, “Hotate/Scallops”, “Maguro Zuke/Marinated Tuna sushi”, and “Amaebi nigiri to Shiraebi Gunkan/Sweet shrimp and white shrimp sushi”, the star of the day was “Kawahagi/Filefish”! 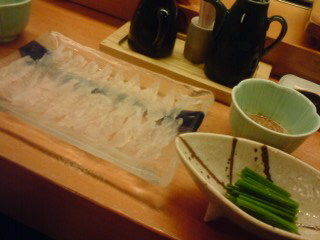 After having taken away the inedible skin, the chef first cut the fillets into very thin slices to be served with thin leeks and dip sauce made of ponzu mixed with the fresh liver of the same fish. 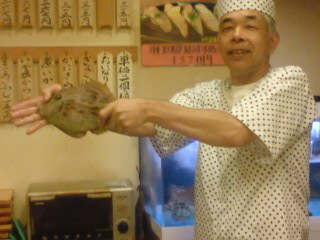 As now is the best season, those comparatively thin fish come up with enormous livers! 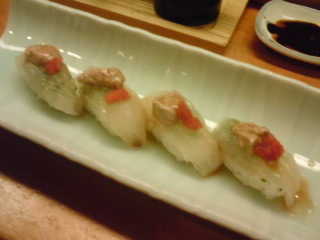 The chef managed to keep four slices aside to prepare nigiri with the fish flesh topped with a piece of its liver, some “momiji oroshi/grated daikon with chili pepper” and seasoned with ponzu! 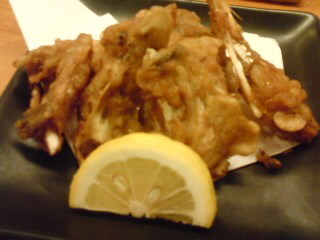 The “cheeks bones” with their meat were last deep-fried and served as they are with some lemon. Simple and great! 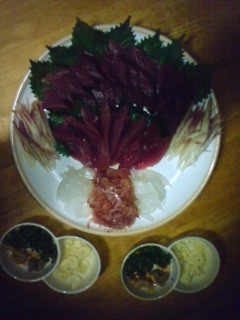 All this with one single fish! San Francisco – October 13, 2008: Foodbuzz, Inc., officially inaugurates its food blogger community with more than 1,000 blog partners, a global food blogging event and an online platform that captures the real-people, real-time power of food publishing in every corner of the world. At launch, the Foodbuzz community ranks as one of the top-10 Internet destinations for food and dining (Quantcast), with bloggers based in 45 countries and 863 cities serving up daily food content. Foodbuzz is the only online community with content created exclusively by food bloggers and rated by foodies. The site offers more than 20,000 pieces of new food and dining content weekly, including recipes, photos, blog posts, videos and restaurant reviews. Members decide the “tastiness” of each piece of content by voting and “buzz” the most popular posts to the top of the daily menu of submissions. Foodbuzz currently logs over 13 million monthly page views and over three million monthly unique visitors. “Our goal is to be the number-one online source of quality food and dining content by promoting the talent, enthusiasm and knowledge of food bloggers around the globe,” said Ben Dehan, founder and CEO of Foodbuzz, Inc. The Foodbuzz blogger community is growing at a rate of 40 percent per month driven by strong growth in existing partner blogs and the addition of over 100 new blogs per month. “The Foodbuzz.com Web site is like the stock of a great soup. The Web site provides the base or backbone for bloggers to interact as a community, contribute content, and have that content buzzed by their peers,” said Mr. Dehan. Based in San Francisco, Foodbuzz, Inc., launched its beta Web site, foodbuzz.com, in 2007. In less than a year, Fooduzz.com and its community of over 1,000 exclusive partner food blogs have grown into an extended online property that reaches more than three million users.